Being a girly girl, it is definitely one of my happy days when I get my nail pampering session. I used to go gaga over sweet pink nails with lots of diamonds and details, but I guess I am getting old already, HAHA! That's why I got this classy black and gold mature design done at COLOR360. 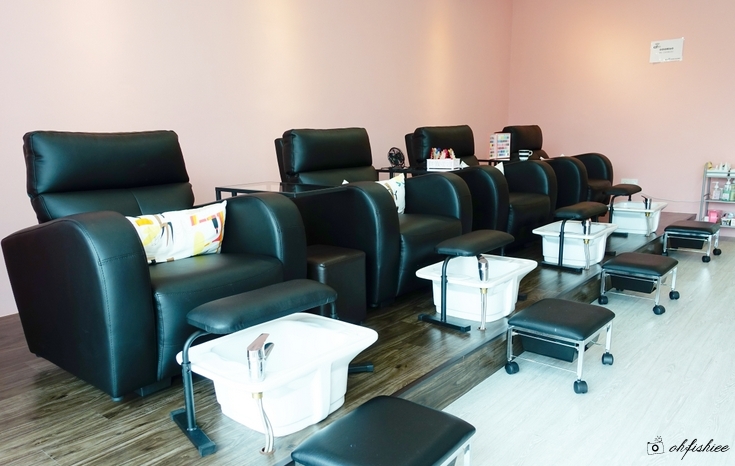 Located just 10 minutes away from Taman Connaught, Cheras, COLOR360 is a newly-opened nail parlour at the new shoplots in Bandar Mahkota Cheras. It can easily be located and visible from the main road :) Just head up to the first floor and ring the bell! Although it is new, all the 3 manicurists here are skilled and experienced ❤ Check out the designs they've done! 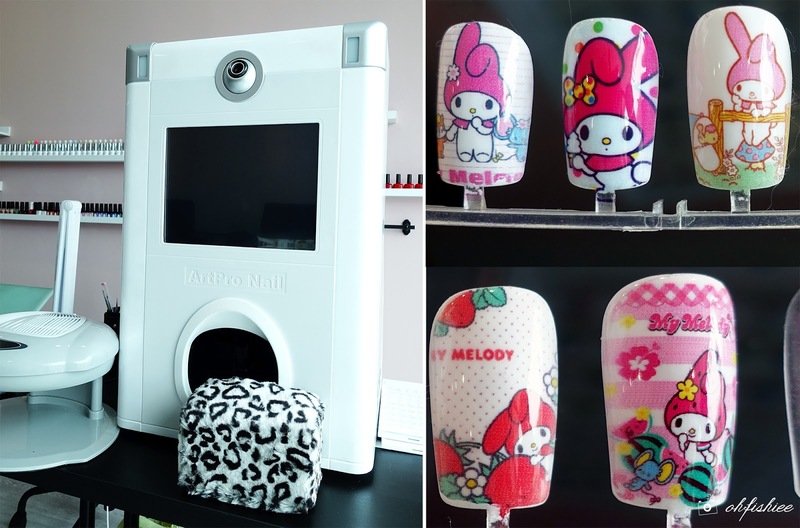 Here at COLOR360, they also use ArtPro Nail Printer to instantly print designs onto your nails itself! Sounds cool right? And the design is fully customizable! For example, you can send your favourite images (maybe your boyfriend's picture?) to them and have it printed onto your nails. For simplicity, the basics are available in myriads of colors too! Apart from manicure and pedicure services, they also do foot massages as well as makeup and hairdo services which I think are perfect for special occasions or weddings. ...followed by the gel base coat application and hand-drawn nail arts that I choose. Look at those details! ❤ I feel really thankful to have Jayvy and Eunice, my manicurists who are super perfectionists. They make sure every single line they draw is straight, precise and not messy at all. In case you're wondering, very fine black lines like these are actually very challenging and time-consuming for manicurists. But they are both extra good at this, so I need not worry if the pattern will go wrong! Oh did I forget to mention that it is super cosy here? The warm ambiance within the spacious pink-walled room is great for one to unwind and just enjoy the session. 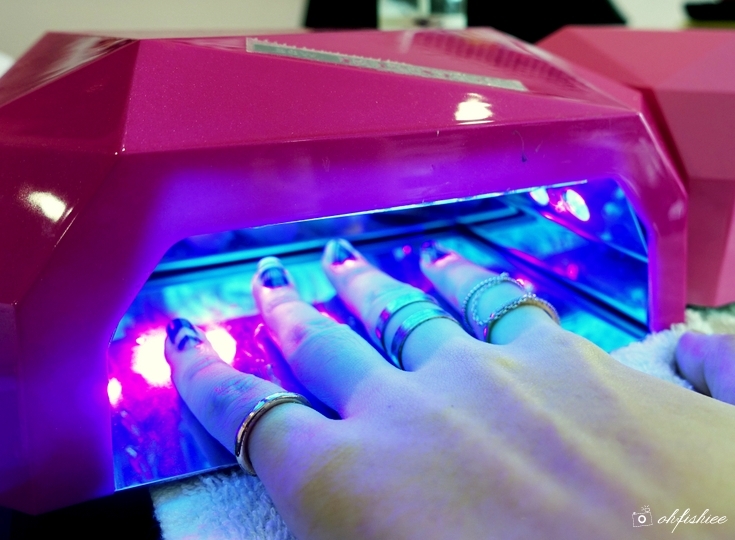 Almost everything here including the LED nail lamp is sooo pinkish and cute that I can die! Honestly, I think the hand-drawn gel nail art is already perfect even without adding any diamantes! Then the creative manicurists add some little round and triangular studs for a touch of elegance. This is just one of the MANY boxes of accessories they have for the nails! In fact, I am surprised to see so many selections of colorful ribbons, studs, diamonds and lots more. If you want something more extravagant, I think they have exactly what you need! It is by far my favourite design after I have tried so many types of gel nail arts. COLOR360 is having special promotion of RM38 Gel Manicure services for ALL first-time customers! For ALL other services, you can enjoy 20% discount too. and the nail-art designing skills they have. 1. Overall, the service is really good. The manicurists are super chatty and bubbly, so COLOR360 doesn't feel like just a place to do manicure/pedicure but also a hideout to relax and meet new friends. 2. For aztec or geometrical design like mine, Jayvy has the best skills I've ever seen. If you prefer cartoon or casual patterns, Eunice is good at drawing those. As for floral designs, do look for Mandy. $38 very cheap but Cheras too far lah! 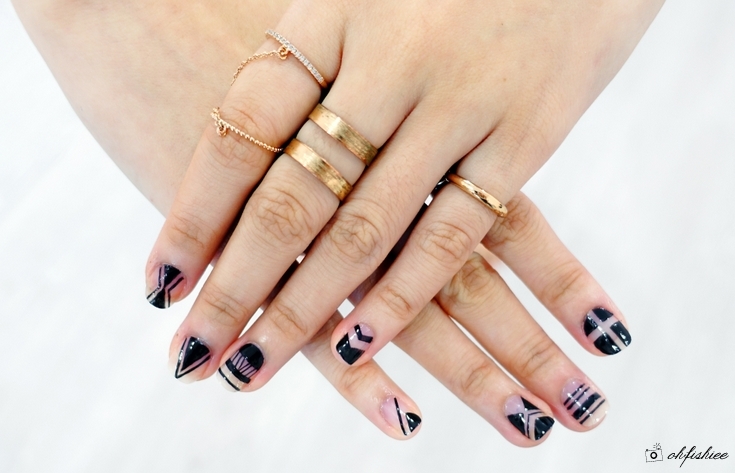 Although your nails look nice, I would have preferred the 3D Gel Nail Art. They are so cute! Just RM38. Quite cheap ler and I love the manicure of your nails. Really creative. Will try mine soon. wow Mahkota Cheras near my bro place. I wanna tell my friends of this too, the nails are so pretty! Dear, I like your manicure especially the cross. RM38? Worth it! I love your nails fishhhhh. SO PRETTYYYY! Cheap! But....Cheras is very far.... 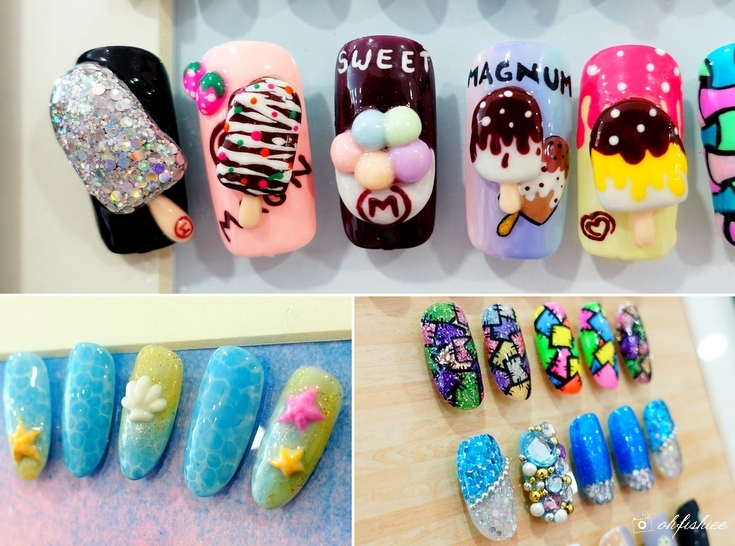 Cute ice cream on the nails, make us attracted :D And different colour also beautiful..Your creative nails are very cool! Fish! those designs are really nice! looks good on you. 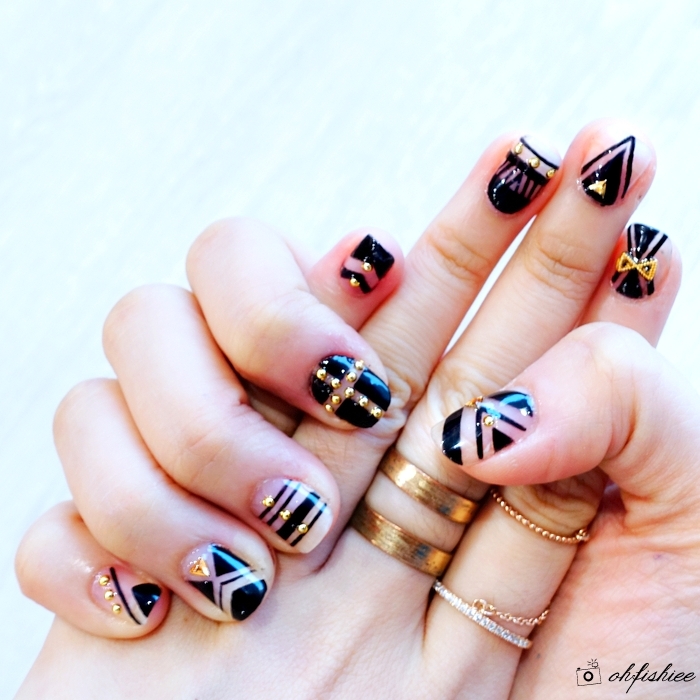 Lovely nail art designs and so creative and perfect for all occasions. Why so kewet :3!! But it's just so far far awaaayyy haha! I like geometrical designs over cartoon, characters or pictures. I've only tried gel nails once and I was super impressed by how long they last! Wahhhh nail heaven. I wish I can get these but too bad la. :( I cook every day so this will get in my way. Waaaa...so jelly see yours! you go all the way there? i always hang out in mahkota cheras, will search out this place for manicures. Oh so cute! The designs are really great! I love how they did your nails too! Happy Wheels: With a slightly different twist you will get a real sensation of the accident. It can happen to everyone, including you. You will be given a real picture of how accidents can occur and lead to bone fractures, loss of consciousness, and death.